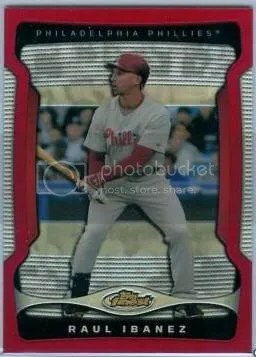 I haven’t added a new card to my personal collection for awhile, but I couldn’t help it when I saw this Raul Ibanez/Shane Victorino 2011 Bowman Platinum dual auto/relic #’ed/10. This is my first autograph of Ibanez and my second of Victorino. I got mine for only $40.00, and another one sold for $30.00. The version numbered to 89 copies recently sold for $70.00. I feel like a got a good deal. Last night I got a tweet from Mario over at Wax Heaven. 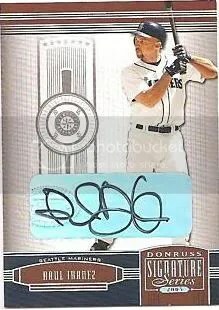 He wanted to show me the new Raul Ibanez autographs and relics that can be pulled from 2009 Topps Updates & Highlights. 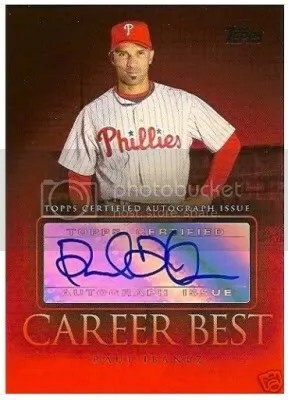 This is Ibanez’s first certified autograph of him in a Phillies uniform. 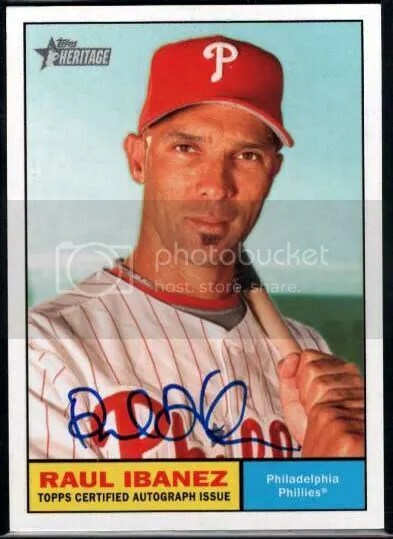 Before this, Phillies fans would have to settle for an autograph of him in a Seattle or Kansas City jersey. 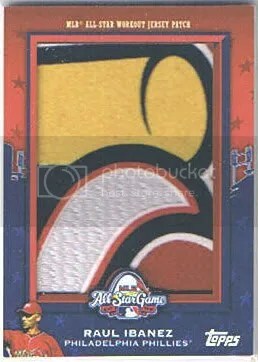 ’09 Updates & Highlights also has the first relic cards of Ibanez containing a piece of MLB All-Star workout jersey. 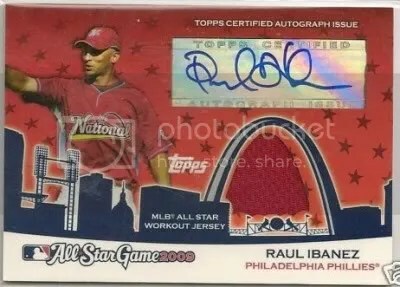 Topps also inserted some great looking jumbo All-Star patches of Ibanez too. After the 3-run blast he hit last night, these cards seem to be in high demand. Lets go Phillies!!! 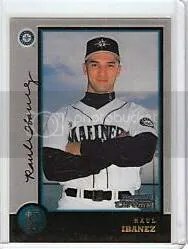 Its going to be hard finding someone that doesn’t think baseball veteran Raul Ibanez is having a good year. As of this writing he is batting .344 with 8 HR’s and 21 RBI’s. 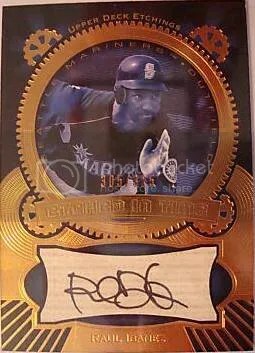 Manufacturers have been pumping out cards of him starting in the early 90’s all the way up until now. I find it interesting that he has NO relic cards made yet. 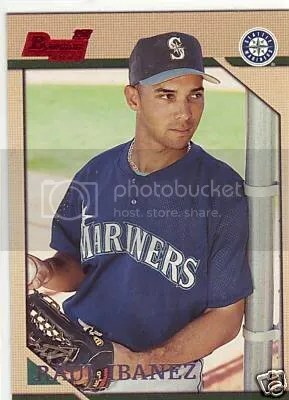 In a time when it seems like there is a jersey, bat, pants, patch, and helmet card made of every single athlete on the planet, this is one player that has been left out in the cold. 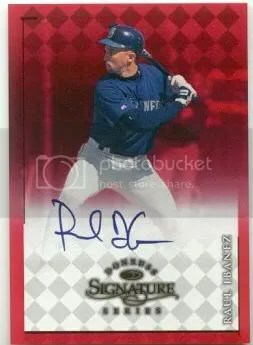 Ibanez does have a few autographed cards on the secondary market from products such as 2004 Upper Deck Etchings and 2005 Donruss Signature Series. 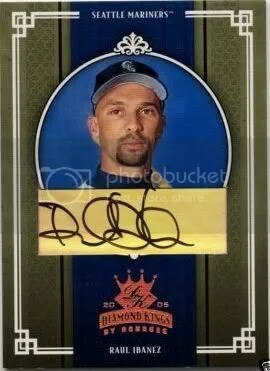 It just surprises me that for someone that has their face on close to 1,000 baseball cards not one of them contains a relic. 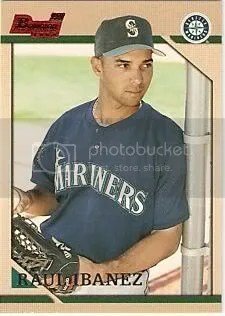 Maybe Upper Deck should have forgotten about Rey Ordonez in 1997 and made a jersey card of Ibanez. 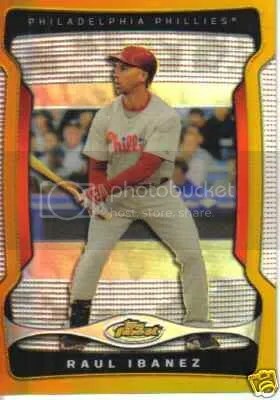 Raul Ibanez, a.k.a the new Pat Burrell, has been a huge addition to the Phillies organization this year. 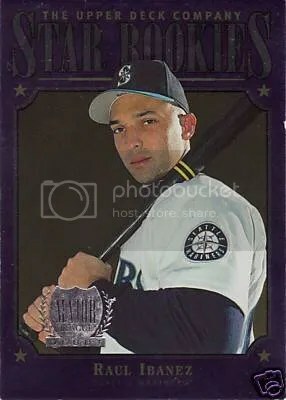 I have to be honest, when I heard who was going to take over for Burrell I had no idea who Ibanez was, probably because he has been hiding up in Seattle for years. 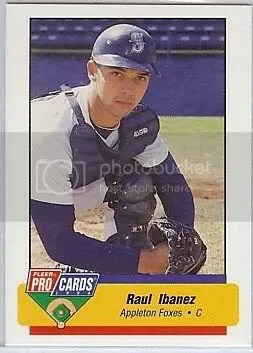 In honor is Ibanez having one heck of a season so far, check out some of his best cards.